TopVue monthly contact lenses are made of hydrogel material and sodium hyaluronate for added moisture. They are equipped with UV filters and AQUAMAX technology. 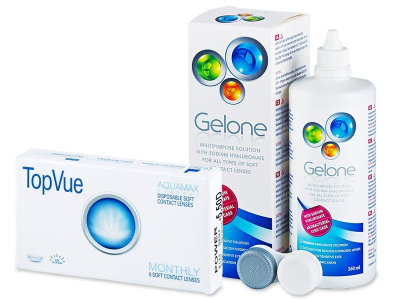 This package contains a 360 ml bottle of Gelone solution, which is suitable for sensitive eyes. TopVue Monthly contact lenses are hydrogel lenses that are made with sodium hyaluronate, a very effective moisturising substance. Additionally, the PEG (polyethylenglycol) wetting agent ensures extraordinary moisture and maximum all-day comfort. Sodium hyaluronate, or hyaluronic acid, is a substance natural to the human body. Besides joints and other body parts, it can be found in the vitreous humour, or the substance that makes up the eyeball.